Terminator 2, a feature-rich Microgaming slot based on the terminator movie of 1991, was released in the summer of last year. The slot comes with plenty of bonus features, challenging players to win 2,950 coins in the free spins round alone. Terminator 2 is quite easy to play in spite of its complex bonus features. The base game is played on five reels with 3 rows and offers 243 ways to win. During the free spins feature, the reel set expands to four rows, giving players 1,024 ways to win. Since the paylines are permanently activated, players do not have to manually activate them. However, they need to bet the minimum of $0.30 in order to play this game. The maximum bet is just $30.00, which makes Terminator 2 one of the most affordable slots in the Microgaming portfolio. Microgaming’s Terminator 2 slot is based on a movie of the early nineties, starred by Arnold Schwarzenegger and directed by James Cameron. This movie relates the story of how Sarah Conner and her young son John flee from T-1000, a terminator that is trying to kill John. Arnie, another terminator, is assigned the task of protecting John. Since the slot is based on the movie, it features authentic movie scenes, graphics, and audio effects. The three-dimensional images, impressive soundtrack, and realistic animations are enough to make players play this slot endlessly. The reels feature icons of the terminator, John, Sarah Connor, and icons of hearts, diamonds, spades, and clubs. T-1000, the terminator machine that can assume any form at will in the movie, serves as the wild in Terminator 2 slot. Players can therefore use the T-1000 symbol to spin winning combinations and get extra payouts. 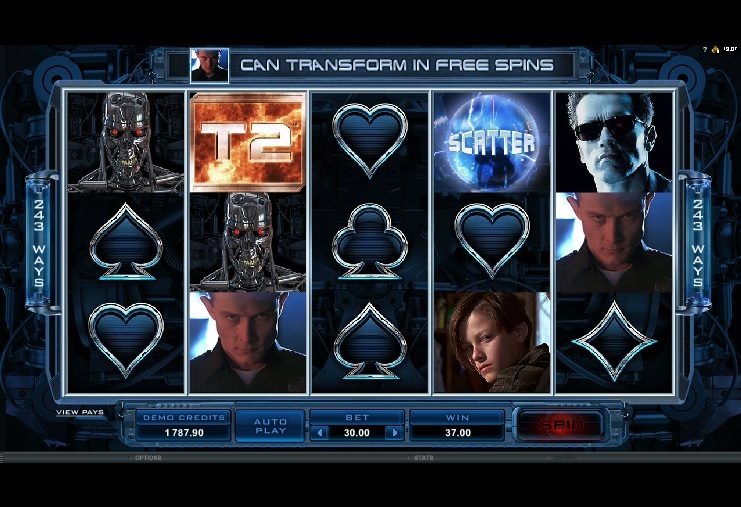 Terminator 2 Slot is famous for its T-800 Vision Feature, which gets activated at random whenever players fail to land a winning combination across the reels. T-800 will then scan for targets and destroy them. Players will win bigger cash prizes if he destroys the high-paying symbols. For example, players will win the biggest payout if the T-1000 symbol gets destroyed. If a scatter symbol is destroyed, the free spins round gets activated. When the free spins round is activated, players will receive 10 free spins, but the reels will be transformed into 5 reels with 4 rows and 1,024 ways to win. The most important symbol is T-1000 as it has the power to substitute for other symbols to give players extra chances of winning payouts. Players can win up to 2,950 times their bet amounts in the free spins round. Terminator 2 is available for fun or real money play at any online slot that operates on the Microgaming software platform.